a slice of pizza (with bacon, black olives and…pickles! ); yeah, I like weird things. Good lord, try ordering a pizza in Japan and see what weird things you can get! No one really made me laugh (boohoo, Monique, wtf! ), but Carl did gross me out, altho I’m not gonna post what he said cause it STILL grosses me out LOL! For the rest of you that guessed it was pizza, well done! Oh and we have a guest photographer this week, Julie! If you don’t see your comments, don’t worry…I’m most likely moderating them! Guess this means I can’t play. Hrmmm… some kind of white cake with coconut? Or a rock? How many guesses do I get?!!! Looks like what I get when I leave a dairy product like cream cheese on the tip top of my fridge: frozen cream cheese. But it also could be the close up of some very white frozen…what? It’s too clean to be snow. 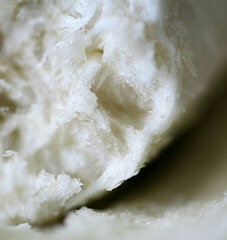 The inside of a fluffy piece of homemade sourdough bread. Yeah. That’s it. Or not. Damn, now I want to go make bread. The fluffy white inside of a biscuit. it is a shot of the airy puffiness that exists in Britney Spears head. I agree with those who said an inside piece of bread but I am going to take it one step further and say an english muffin, not frozen but not toasted either (only prblem with this guess is I don’t really think you eat english muffins) so the person who guessed sourdough bread might be closer to right! VANILLA ICE CREAM!!!!!!!!!!!!!!!!!!!!! WOOHOO, what is my prize, hmmm???? It looks like ice cream to me, or maybe frozen yogurt. Something doughy, bready and delicious like a kind of, um, bread. Please have Julie send me some when this is done. kthxbai. At first I thought it was the fluffy inside of a hot roll, but the more I looked at it I think is it ice cream that has ice crystals on it. My guess would be bread of some kind probably a French or Italian Loaf. Second guess, It sound s gross but, some kinda mold. looks like a cinnamon roll with icing to me. Yes, I know exactly what this is: my brain after taking my precalculus final!! I’m thinking mashed potatoes, or Grits, but I have no idea what grits look like! yeasting something – not yet ready to be served. If not, it’s a blurry photo and I’ll sue your friend for bluffing. LOL. btw. Just now in Windy City.